Following privatisation, this bus passed to (then) fellow Drawlane company North Western with the north Cheshire operations of the company in 1989. 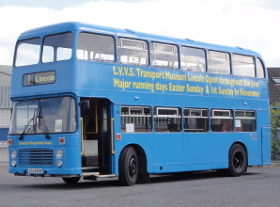 Withdrawn in 1997, it passed initially to Hill's of Hersham, Surrey (with a loan spell to North Surrey Buses) then in 1999 to Victory Tours of Sixpenny Handley, Dorset, both mainly for school contract services. The latter painted the bus in a dark blue livery. In 2001, it passed to Verwood Bus of Verwood, Dorset, where it ran in a two-tone blue livery on school and stage carriage services until 2010. In 2010, it passed to the Society, with a view to use as a future source of spare parts for the Society's Bristol VRs. However, late in 2011, the decision was taken to return it to running order, principally to provide additional capacity on the Society's park & ride service at RAF Waddington International Air Show. It will carry a modified version of Verwood's livery in this role, at least initially. July 2012 - Although owned by the Society but not officially preserved (it was acquired for spares for the two Museum VR's) an opportunity has been taken to tidy it up for use at the Waddington Air Show by several members. Thanks to Pam, John S, Neil, Ian, Steve L, Andrew and Steve M, Andy, Mike G, Dave H, Dave G, Nick, Norman, Cliff, Steve D and others for their endeavours here. January 2013 - The 'buggy bus' has received new brake cams to the rear axle. July 2013 - Not officially part of the museum fleet, this useful vehicle is used at events such as Waddington Air Show, and has been lettered to advertise the Museum and coming events. This vehicle is currently in the workshop and is not on public display.